Another problem I find with this experiment is the expectation itself. I decided to study the effect on a very simplistic basis to undersand the nature of this second order effect. While my calculation method is longer than the formula, it is simpler and retains the understandings of the inner workings of the effect instead of relying on faith in the correctness of a formula. The purpose of my site is to communicate close to the level of laymen so that anyone examining it can remain confident in the correctness of what is being conveyed. The reason the reading is so very small in this experiment is because of the fact that the light does not simply go with or against the flow but it does both because of the reflection. Many people erroneously assume that because the light is sped up in one direction but then equally slowed down on the return trip that there is an exact cancellation. This is not true of course and I've made some simple diagrams to help understand the concept of this second order effect. Imagine a swimmer that swims to one point and back at a constant speed. In the chart below and even visualizing the numbers yourself using the above drawing you can see how the effect occurs. Additionally you can see how the effect decreases as the difference between the swimmer speed and the river flow grows. Finally you can see that length does not effect the relationship. The total time travelling (and path length by the swimmer's estimation) grows by a certain percentage based on the prior mentioned relationship. Now that I have established the relationship, I can deal with the the Earth's speed (flow) and the speed of light (swimmer) in units of their relationship. You can use the "relation to norm" to determine how much longer the path length and/or travel time should be in any MMX-like experiment if there was no such thing as entrainment. 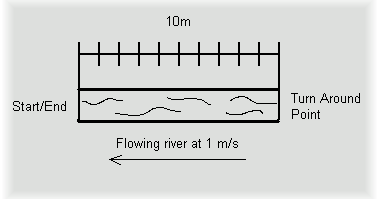 The above examples show how distance can scale so long as the relation between the swimmer and flow remain the same. "Considering the motion of the earth in its orbit only, this displacement should be 2Dx1.0e-8" (220 nm)Next he goes on to say that "The distance D was about 11 meters, or 2e+7 wavelengths of yellow light; hence the displacement to be expected was 0.4 fringe" This tells us with certainty that he believes his light to be 550nm which is actually green. However, the most important consideration that can tell us for certain what the real wavelength of the light being examined in his white light interferometer experiment was the fact that he used sodium light to line up the fringe system! Since the sodium doublet (special double fringes from sodium interferometry)resides at 589.0nm and 589.6nm and he calibrated his interferometer with sodium light, the darkest fringe was set for 589nm and this differs from his belief about the wavelength. (it's also yellow instead of green) This means that his expectation of .4, while close, is not quite right. For those of you following Michelson's mathematical path that would mean that D is 11 meters / 589nm. (18675721.562 waves) resulting in an expectation of a 0.368566 fringe shift without aberration. (29.78^2 / 299,792.458^2) * 37351443.124 = 0.368566. This effect is so small that I find it almost unnecessary to write about but because Michelson mentions it at the beginning of the paper, I will also. There is actually a small effect perpendicular to the wind called aberration. However, because it is only a second order effect it calculates to only about 1.34nm extra path length. This should be subtracted from the expected path length difference for ultimate accuracy but it can be ignored for the most part. The above figure should reveal the easy misconception on the left and the actual effect on the right. The above drawing should suffice for puzzling it out yourself. The important thing to remember is that the concept picture Michelson represents at the beginning is misleading. 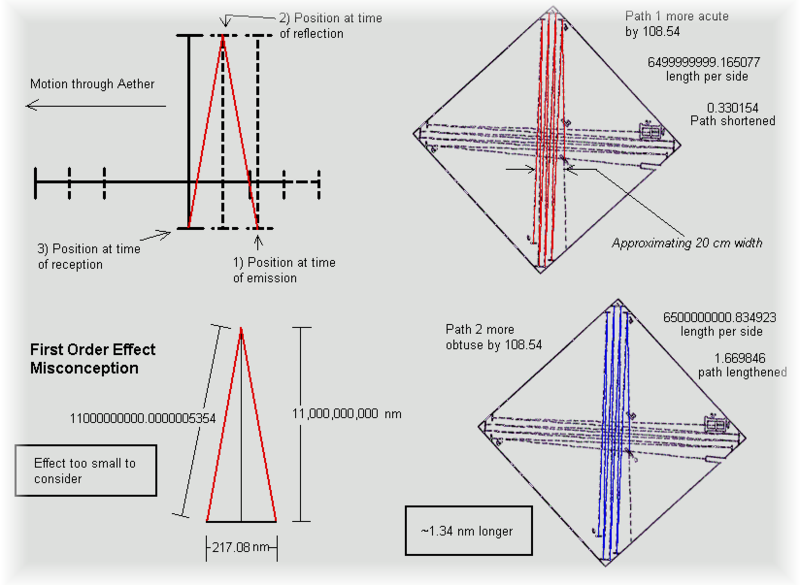 The total path during which aberration is happening goes both with and against the wind for the round trip on the actual interferometer instead of the idealized concept. The red path on the left in the above drawing is propagating slightly into a headwind and the blue path below it is propagating with a tail wind. A quick substitution of a few numbers reveals the nature of what was actually detected by the interferometer. Let's suppose that the differential speed we expect between the earth and the ether is around one-third what Michelson expected. In consideration that a single number on the measurement device represents an average .02 (.025 - .0166) of a fringe/wavelength, .03465 of a fringe is what was detected. Slightly less than 10 km/s is what the original MMX detected. In this case you have a grand total of 0.00000054271nm extra path length or a 9.214e-10 of a fringe shift. Only readings smaller than this can be considered truly null by typical standards. 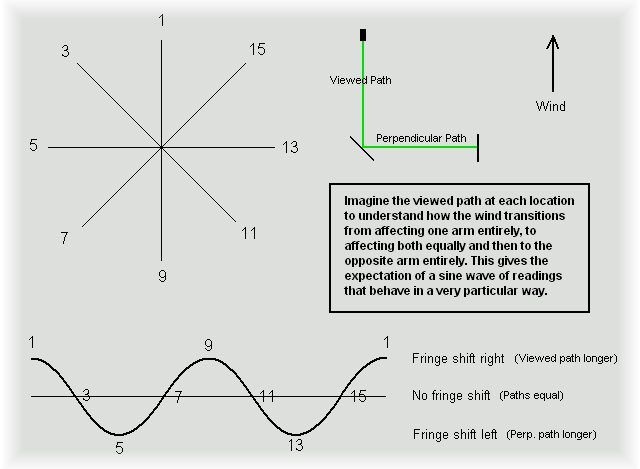 Another expectation that is not discussed in the relativistic community is the way the readings would change as the interferometer was turned in a full circle if there was an ether wind. This is a very outstanding behavior because it is a half period effect. This means that a full iteration of some cyclical event happens in only one half turn of the device. The wind was expected to cause the readings to both instead peak and trough twice during one full rotation. Copyright © 2010 Anti-Relativity. All rights reserved.